From ""Warm Finger Foods"" to ""Something Sweet,"" Ritchie, the host of Food Network's Ultimate Kitchens, makes harmonizing a diversity of small dishes seem like small potatoes. 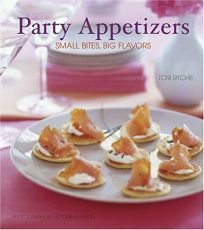 With sumptuous photos by Chronicle regular Victoria Pearson, Ritchie offers nearly 50 recipes and multiple ways of combining them into luscious platters, as well as advice for keeping it all together: e.g., ""you are the most important guest, so treat yourself like one and don't demand more than you can give."" Texas Caviar includes black-eyed peas and apple cider vinegar; Mystery Tidbits and Hasty Hots contain olives, mayo and 12 slices of white bread. Some hosts will happily attempt the Goat Cheese with Cumin and Mint, others the Filet Mignon with Horseradish Cream, and still others will do both, along with Crostini with Roasted Eggplant, Red Pepper and Mozzarella, and end with Chocolate-Hazelnut Truffles. With a little planning ahead, Ritchie's enticing descriptions, enthusiasm and clear directions will have readers out of the kitchen and in a terrific conversation at their own humming party.